UPDATED – WASHINGTON (CNS) — The Russian Orthodox Church’s decision to sever ties with the Ecumenical Patriarchate of Constantinople will affect ecumenical dialogue, but long-term implications remain unknown. Paulist Father Ron Roberson, associate director of the U.S. bishops’ Secretariat of Ecumenical and Interreligious Affairs, said the split reveals disagreements on some “pretty significant issues” among more than a dozen Orthodox churches. At issue is the role of the ecumenical patriarch in the Orthodox Church. The patriarch — currently Patriarch Bartholomew of Constantinople — has always been recognized as first among equals, with the authority to organize pan-Orthodox activities like international dialogue with the Catholics. However, Russian Orthodox Church leaders do not believe Patriarch Bartholomew has the authority to interfere in the internal affairs of individual Orthodox churches. They say that is what he did when he granted canonical recognition to two independent Ukrainian Orthodox churches. “It could be the beginning of a schism that would be long-lasting” if others follow the lead of Moscow, Father Roberson told Catholic News Service Oct. 16, the day after the decision was announced. For instance, he said, the Serbian Orthodox Church has been supportive of Moscow’s position. It is “unknown what the implications will be,” he said. Father Roberson, who has written and updated “The Eastern Christian Churches: A Brief Survey,” referred to a similar dispute in 1996 over the Orthodox in Estonia, a former Soviet Republic. The ecumenical patriarch reconstituted a church there over the wishes of the Russian Orthodox Church. In the end, he said, they agreed that Estonia would have a church under Constantinople and a diocese under the Moscow Patriarchate. In Ukraine, for decades there have been three Orthodox churches: two self-declared autocephalous, or independent, and not considered canonical by the other Orthodox churches. The Ukrainian Orthodox Church in communion with the Moscow Patriarchate was considered canonical. Earlier in October, in an effort to unify the Orthodox in Ukraine, the ecumenical patriarchate’s synod recognized both independent churches as canonical churches and reinstated the heads of both as bishops in good standing. 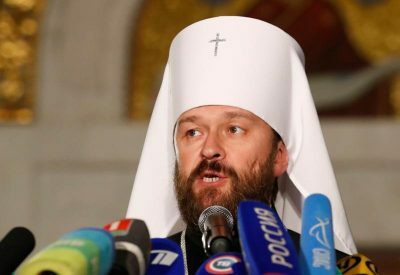 In severing ties with Constantinople, Moscow said it would not participate in any international dialogues if the co-chair is a bishop of the ecumenical patriarchate. PREVIOUS: Houston panel explores why people migrate to U.S.